The Crankbrothers 5050x Flat Mtb Pedal Silver/anthracite Only is no longer available, although you may find similar or newer versions below. Crank Brothers steps up to the plate to provide downhillers freeriders and BMXers with one sweet platform pedal. Most flat pedals have the traction pin's hex hole on top making them very difficult to remove if they break or are worn down. The 5050s have removable plates so you have full freedom to customize pin location for rider preference and terrain. Crank Brothers steps up to the plate to provide downhillers freeriders and BMXers with one sweet platform pedal. Most flat pedals have the traction pins hex hole on top making them very difficult to remove if they break or are worn down. The 5050s have removable plates so you have full freedom to customize pin location for rider preference and terrain. Additionally this puts the pins hex-hole location on the back of the plates making them easy to remove after heavy duty use. 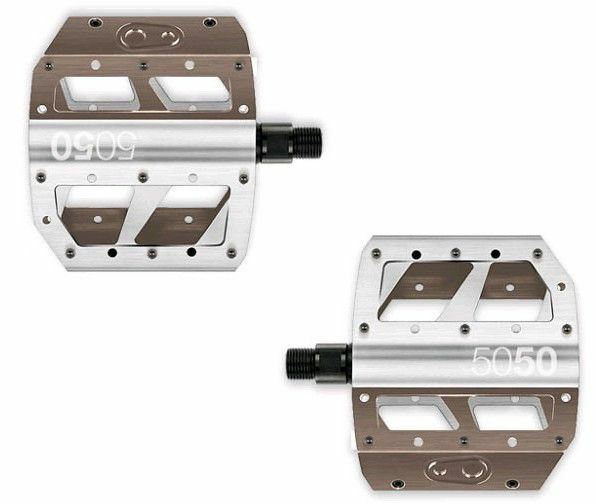 The 5050x pedals are crafted from 6061-aluminum and utilize a cup-and-cone bearing system that is completely user-serviceable too.